that whales have to be blue? Just change them to pink and call them Whilemina! I am making two different versions of Old Fashioned Baby Baby's Summer Clothes romper with the sweet diaper shirt. I made "Wally" posted here last spring. I just turned him into a her! I lengthened and curled her eyelashes and may add a bow to her spout. This is for our baby and hopefully tomorrow evening I can stitch on the second one. It is for a baby gift for youngest daughter to give. Whilemina is done with shadow work using one strand of floss. The waves are stem stitch. 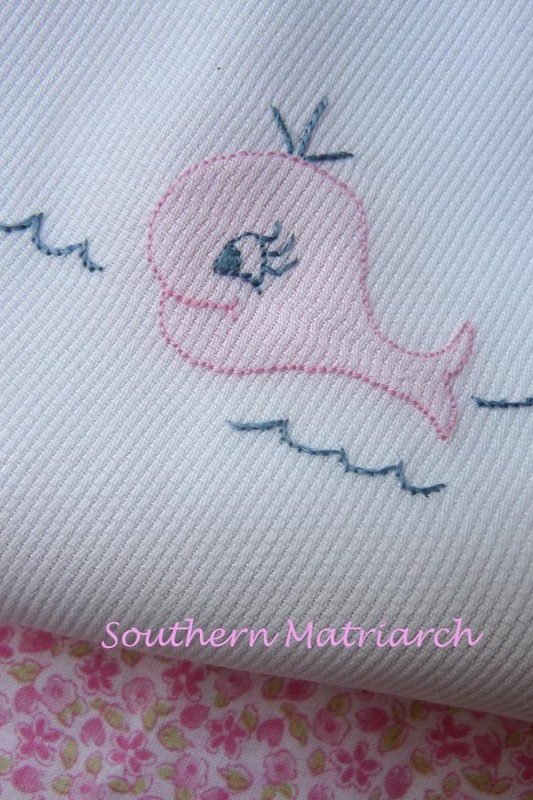 The fabric for the diaper shirt is lined poly/cotton pique by Spechler Vogel. Couldn't tell you where I purchased it. I have quite a large piece in my stash and it takes a while to use up on newborn sized things. The floral for the romper is a floral lawn. Our baby mommy doesn't mind ironing. It was nice to thread a needle and to sit and stitch a spell. It calmed my spirit. I am just now feeling like I can come up for air. Baby mommy is looking great, though she doesn't advise her method of post partum weight loss. Hopefully she will continue to recover and feel even better as the days go by. I love Whilemina, and I'm so glad you are getting to do some sewing! Prayers continue for complete healing, and rest for all of you! You are just so clever! I can't wait to see Whilemina in all her glory and completed. Love the idea of a bow. I might have done that myself!! In our stitching world, creatures can be what ever we want them to be. Pleased that Erin is on the mend! And you can stitch and breath. So cute! 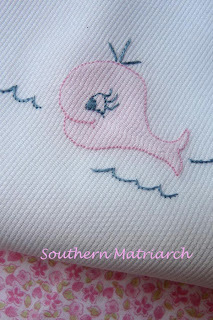 Reminds me of baby clothes and blankets from my childhood when elephants and giraffes were pink or blue or yellow! Happy to hear that everyone is on the mend, and that you are stitching again! 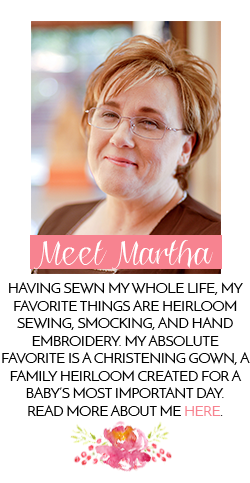 Martha, I just want you to know how much I love your blog!! It is so beautiful and well-organized. I know that I can always come here for ideas, tutorials, etc. I am so glad that your daughter is getting better. Thanks again! Martha, it is great to see you stitching again. Happy to hear that Erin is continuing to get well. Oh I just love it! Can't wait to see the finished garment! What a precious whale!!! I can feel that sigh of relief in your voice!!! So glad that Erin is on the mend!!! I'm just trying to catch up on reading blogs and saw where your daughter has been ill. I'm so sorry. I'm glad she is better. I'm at my daughter's with her new born baby girl and almost 3 year old and her husband. I'm having the time of my life. The little dresses and gowns you have made are precious. My little grand is getting a few new things, too, but nothing that pretty.